This will not come as a surprise to most, but I am a huge fan of the inclusion of any sort of raw food into a dog's diet. I always like to say "some raw is better than no raw." There is a convenient, easy way to add some raw goodness, or a bit of raw protein variety, to your dog's diet, without taking up precious freezer space. This post is sponsored by Instinct® and the BlogPaws Professional Pet Blogger Network. I am being compensated for helping spread the word about Instinct® Raw Boost® Mixers but My Rotten Dogs only shares information we feel is relevant to our readers. Instinct is not responsible for the content of this article. More and more pet owners are recognizing the benefits of a raw diet. (Yay!!) These can include improved digestion and a healthier GI system, increased vitality, and a healthier coat. Benefits vary from dog to dog, as each dog is different, and the amount of raw and length of time fed are also variables. For some, the thought of feeding a full raw diet is overwhelming, and/or they do not have enough freezer space. 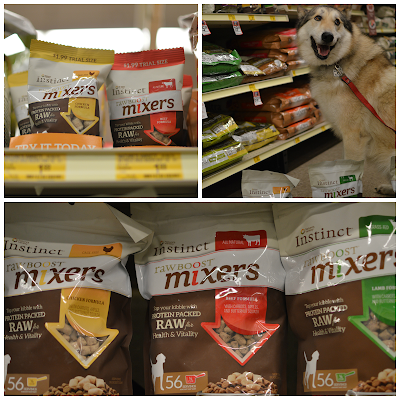 Some raw is better than no raw, and Instinct® Raw Boost® Mixers make it possible to add raw nutrition to your dog's diet in an easy to serve and store form. They are shelf stable at room temperature, and are grain free, gluten free, and can be used as a mixer or a topper for your dog's regular food. Learn more about them HERE. They are also an easy way to give your dog (raw fed or not) a bit of protein variety. It is typically difficult for me to source lamb for my dogs, so the freeze-dried Raw Boost Mixers are a convenient way to offer lamb to my crew. Instinct Raw Boost Mixers are easy to purchase, too! Simply head to your local PetSmart! Faolan and I did just that, and met my brother there. Little boy couldn't wait to get inside! The Raw Boost Mixers are located with the rest of the Instinct products. There are four proteins available for dogs-beef, lamb, turkey, and chicken; and two available for cats-rabbit and chicken. Three different sizes are available. The smallest size is a trial-sized bag, perfect for trying out different proteins to see if your dog has a favorite. These are currently on sale 3/$5. My brother bought a few for his dog, Sully. The large bags of Raw Boost Mixers are also currently on sale for 20% off. While at PetSmart, several people commented on how soft Faolan's fur is. I attributed it to his raw diet, and pointed them in the direction of the Instinct products. Faolan and I picked up a few bags, and headed out. He had to play with a 12 week old Golden Retriever and a 6 month old Newfoundland prior to us leaving, of course. 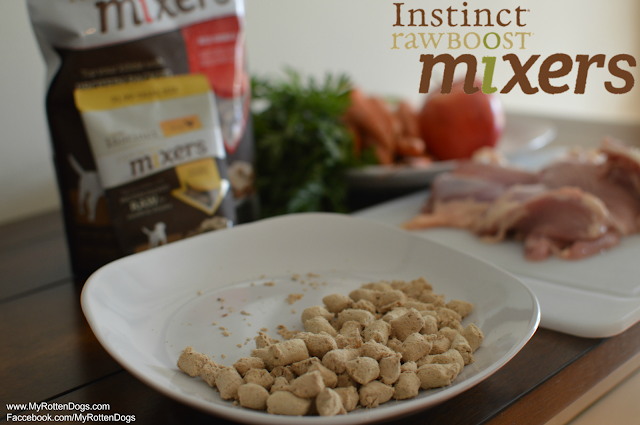 The Instinct Raw Boost Mixers can be used to top or mixed in with kibble, canned, or other raw foods. I gave all three dogs some over their meal of ground venison the first night, and Neeko picked out all the Raw Boost Mixers to eat first. I offered Faolan some over some Instinct canned food, and he his response is humorous. I love this expressive boy. Needless to say, he enjoyed the Raw Boost Mixers, as he can be seen picking them out first. 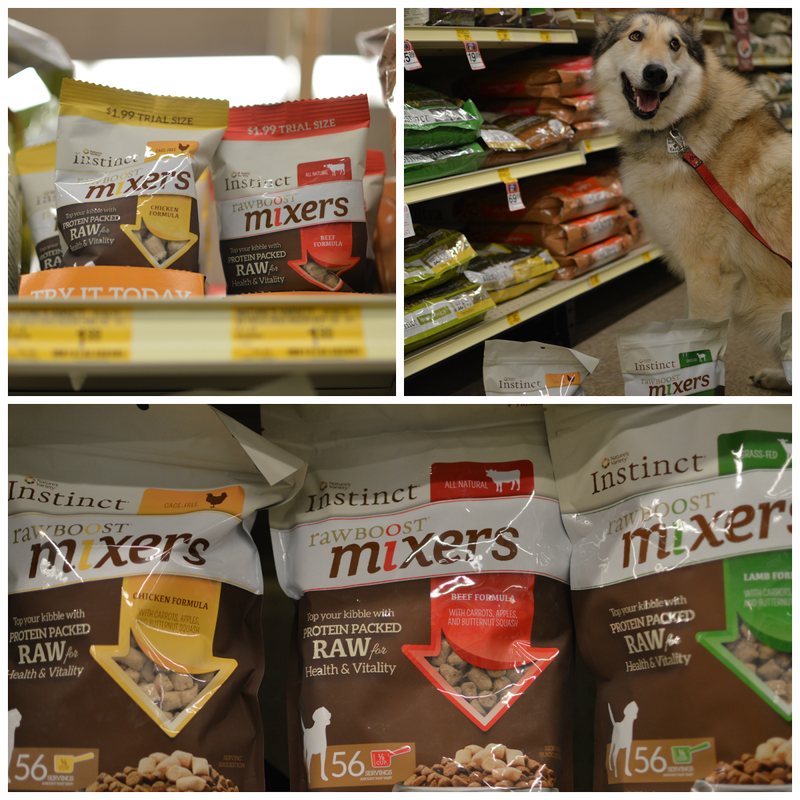 The short of it-Instinct Raw Boost Mixers are freeze-dried natural raw goodness, and an easy way to offer some raw to your pets, or some raw variety. No freezer space required, simply open, serve, seal, and store at room temperature. They also make excellent treats, as my dogs are willing to work hard for them. Find them at PetSmart! Find Instinct on Facebook, Twitter, and Instagram. Do you ever offer your pet any raw food? What is their favorite? This is a sponsored conversation written by me on behalf of Nature's Variety. The opinions and text are all mine. I'm a huge fan of some raw. I think a partial raw diet is better than a 100% dry food diet. Thanks for being a raw voice over at BlogPaws. It's nice to see variety in diets coming out of that community. We really like the Instinct brand and their raw frozen is what convinced me to make the partial switch. The girls get a raw frozen meal every other night, and I always top their kibble with freeze dried raw like the Mixers. I definitely don't have the freezer space to do raw full-time but I believe in its benefits as well as those from variety in general, so I love feeding all the different formats. Great review! We're trying to get away from kibble at least partially, and I just got some of this (lamb) to try adding to their kibble. I can't wait to see if the dogs like it...it sounds like they will! I've been wanting to try the Raw boosters! We feed try to feed some raw whenever we can. Phoenix can only have commercial raw or grinds so you probably know how expensive that is. We can't really afford it that often but we try! Faolan is super adorable - and I have no doubt that his coat is amazingly soft! I transitioned my pups from kibble to raw about 7 months ago and haven't regretted my decision one bit! Freeze-dried or dehydrated dog meals are definitely a great starting point to feed a healthier diet - plus, they're convenient when traveling!! It was a lot of fun meeting hanging out with you and Faolan at PetSmart! I am also really impressed by the Instinct Raw Boost mixers. Silly loves them! These are one of the dogs' favorites, along with Primal. I love the Mixers because it's easy to just toss some into their kibble bowl each morning. Fantastic photos, by the way! I definitely agree that some raw is better than no raw at all. 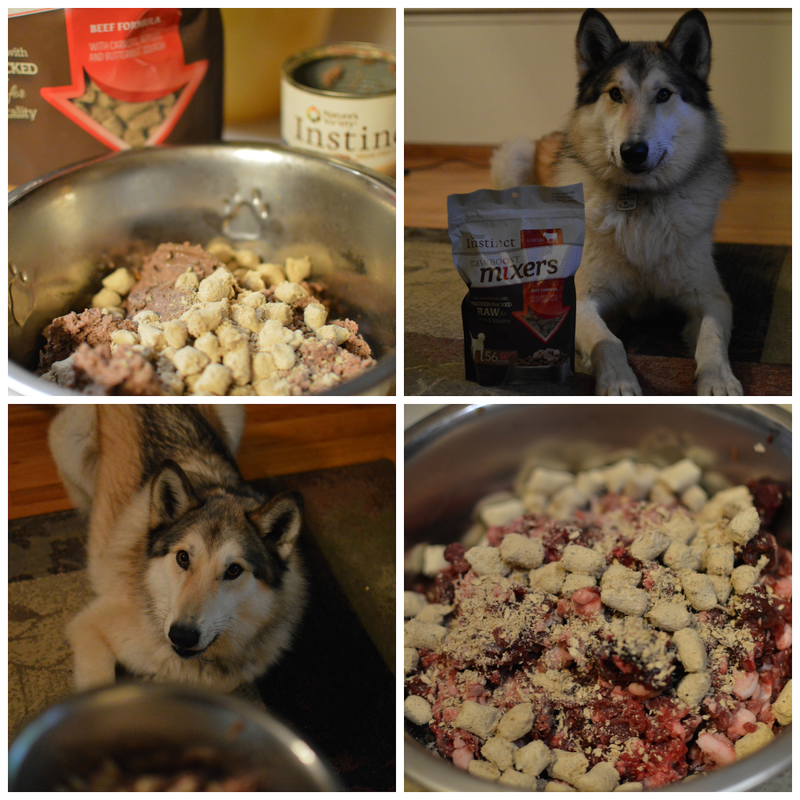 The freeze dried raw food in Instinct Raw Boosters are a great way to add raw nutrition to your dog's diet without the overwhelming aspect of dealing with raw meat yourself.